Location: Cornwall, Near Trewoofe. (SW 432 245). Grid Reference: 50° 3' 54.5" N, 5° 35' 19.34" W.
This is the best known and preserved circle in Cornwall: it is believed to be complete, which is rare in itself. Its nineteen granite stones are not large (The tallest, 1.4m high, is in the south west, and the shortest directly opposite), but neat and regular, and form a perfect circle of 23.8m (77ft 10in) diameter. The stones are regularly spaced and exactly at the east there is a gap (an entrance or the site of a missing stone). The Merry maidens were re-erected 1860-70. They are regularly spaced apart by 3.7m each. Rosemodress Circle, Rosmodreuy Circle, Dons Meyn, Dans Maen, Dawn's Men, Boleigh Circle, Boleit Circle. The Merry Maidens stand at the centre of a large complex of prehistoric monuments which include the Tregiffian Entrance Grave, the Pipers, and other menhirs, holed stones and barrows. There are also references to a further stone circle close by. Other Sites in the Vicinity of the Merry Maidens. Although the Merry Maidens are also called Dawn's Men. This name has nothing to do with sunrise: it is a corruption of Dans Maen, or Stone Dance in Cornish: a story of nineteen maidens dancing on a Sunday who were transformed into stones. The pipers that had played for them were petrified too: the two standing stones called the Pipers are in a field to the north-east of the circle. This legend was probably initiated by the early Christian Church to stop the pagan Cornish peasantry continuing old habits. 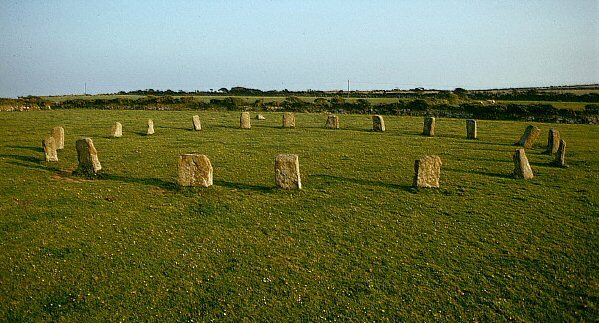 Petrifaction legends (people are turned to stone), are commonly associated with stone circles, being reflected in their names, for example, the Tregeseal Dancing Stones, the Nine Maidens of Boskednan, as well as the more distant Hurlers and the Pipers on Bodmin Moor. One of two holed stones known in the area, now the gatepost to a field to the north, was recently known as a ’betrothal stone’ through which engaged couples held hands. In West Penwith there are 5 stone circles with nineteen stones including this one (Boscawen-un and Tregeseal). This is loosely suggested to relate to the lunar cycle of 18.6 years or the 19 year Metonic cycle of the sun and moon. Sir Norman Lockyer suggested the the Merry Maidens (and the nearby Pipers) were one of several sites where Arcturus was used as a 'star-clock' (2). Article: Cornwall Archaeological Unit's Review of 1995-6. 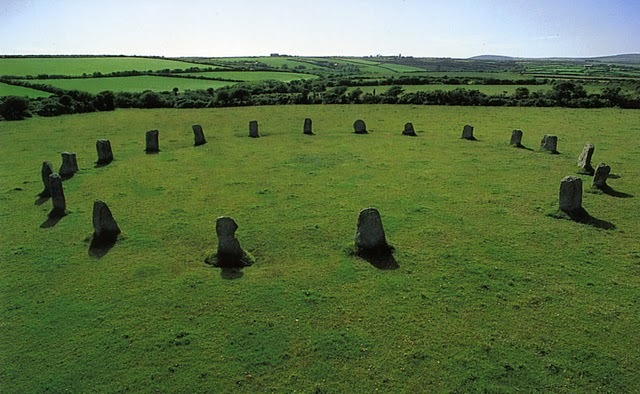 "The Merry Maidens (SW433245) is one of the best preserved and probably the best known stone circle in Cornwall. 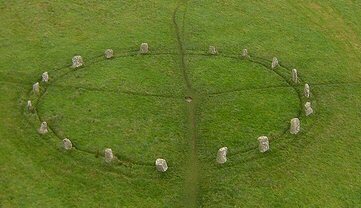 It came as a shock then, in June 1995, when Mike Rosendale of Penwith District Council reported that the circle had been vandalised; one of the stones had been uprooted and left prostrate on the ground. Before the stone was re-erected the stone hole was excavated by Charlie Johns and Andy Jones of the CAU. They made the surprising discovery that the stone had originally been set at right-angles to the circle and that when restored in the 19th Century it had been turned through 90 degrees and placed in line with the circle. On this occasion the stone was set up again as it had been before vandalism". 2). Sir. N. Lockyer. Stonehenge and Other British Stone Monuments Astronomically Considered, 1906.